My wife and I don’t go in for all the trappings of Valentine’s day. Recently I saw a headline that said the average person spends $142 on Valentine’s day. I am sure that includes chocolates, flowers, and dinner out. We tend to like to do things a bit more simply. Salad – I prepared a salad of spinach and romaine for greens. I included carrots, onion, radishes, and mushrooms. Chicken breast seasoned with lemon and rosemary. I seared it in a cast iron frying pan in a bit of extra virgin olive oil. Once it was seared, I added additional lemon juice and baked it in the oven at 350 for about 30 minutes. My wife selected a white wine. We didn’t have a formal dessert, but she did indulge in one of the Godiva truffles that accompanied her card. 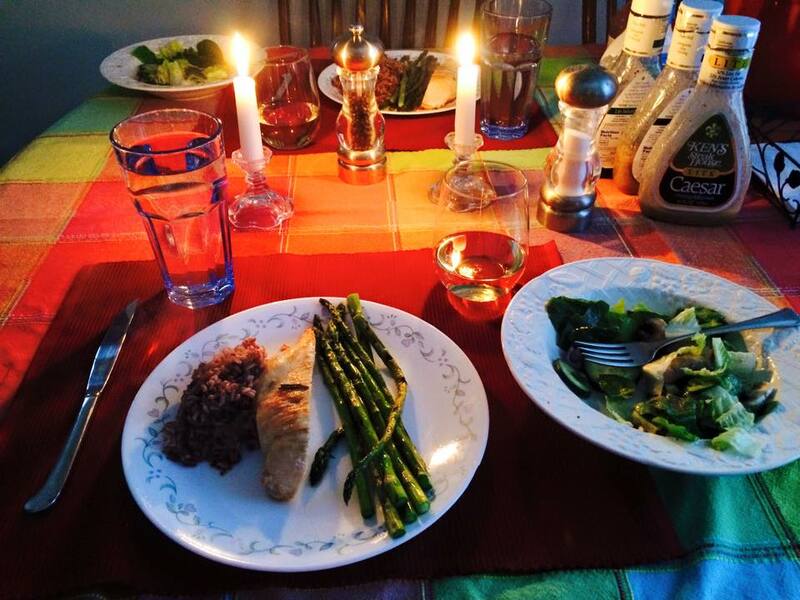 I added in candles and new, red place mats, and the dinner was complete. We had a fantastic time, we didn’t fight traffic, and we didn’t blow up our budget or our diets. After dinner we played a game of Scrabble, then settled in to watch TV together. I would have to say it was one of the best Valentine’s days I have ever spent! That sounds absolutely delightful and romantic.